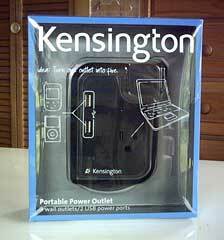 Power bars have been a virtual necessity and a ubiquitous presence at computer workstations for two decades now, but a new wrinkle on the power bar concept is the Kensington Portable Power Outlet, which packs not only three wall current outlets into a single compact unit, but also adds the convenience of being able to power or charge USB devices directly as well. 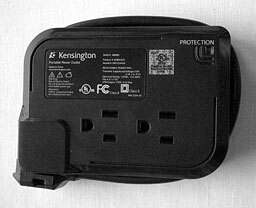 Utilizing both sides of the unit for plug outlets maximizes utility while keeping physical dimensions small. 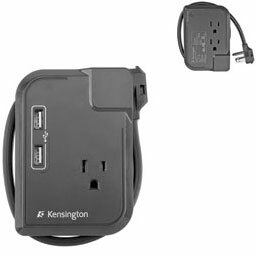 The Portable Power Outlet includes 2 USB power ports in addition to 3 standard AC outlets, allowing you to charge devices like your iPhone, iPod, PDA, or digital camera simultaneously with your laptop without being obliged to pack each device's own power adapter. 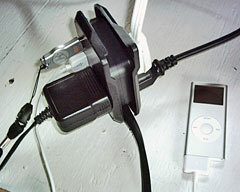 The Portable Power Outlet also features built-in surge protection with a status LED to protect your hardware against power spikes and a short, flat-wrap extension cord that stores neatly around the body of the device when not in use, keeping it compact and more convenient to carry in a computer briefcase or backpack. This is such a good an logical idea, I'm surprised it didn't catch on a long time ago, but I guess it took the proliferation of USB bus-powered and/or charged devices to create a viable market. 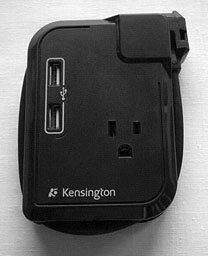 There is only one other similar device on the market that I'm aware of and it has just one USB port and sells for five dollars more than the Kensington unit. In summary, I can't think of anything to criticize negatively about this product. It's inexpensive, innovative, convenient, and useful, and appears to be well-made. I suppose that a USB hub function would make it even more desirable, but perhaps that's a bit greedy for $25. Low End Mac rating, 4 out of 4. 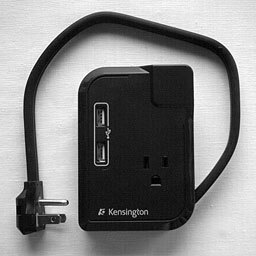 The Portable Power Outlet is backed by the Kensington 2-Year warranty.